Mapping Salt Lake City | Stories, Memories & History - This is the Place. DEF: Simulacra noun, plural sim·u·la·cra . 1. a slight, unreal, or superficial likeness or semblance. 2. an effigy, image , or representation. "The reason I say that 'this is the place' is because no other place could be the place," — W.W. Riter, an original Mormon pioneer. July 25, 1921. The exodus of the Latter-day Saints from the eastern United States left those early American pioneers in search of a place to call home. Westward they journeyed, and to the west they finally arrived, as many settlers did, ravaged by disease and hunger and weariness. hillside, and looked down upon the Salt Lake Valley below. "This is the right place. Drive on." This place, eventually, will become a park. Initially, it was nothing at all except the point at which most immigrants first came to view the valley. Then, for a time, through eras of war, the army used it as a proving ground for artillery. 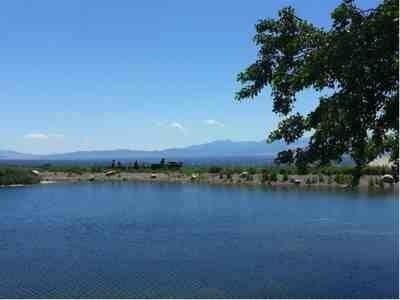 Eventually, in 1957, a group of private investors purchased the land and donated it to the state of Utah, which established Pioneer Trails State Park, the place that now stands as This Is The Place Heritage Park. A replica of the Eagle Gate wings that bordered Brigham Young's own downtown Salt Lake home spans the park's entrance, marking the beginning of a journey into the treasured and surreal. A trailer car made up to look like a trolley train runs from one monument to the next, down past a bowery, symbolically placed near the entrance because these were typically the first structures built in a pioneer settlement. This one was constructed at the park in 1995. Along the same side of the road sits a small cluster of apple trees, representing the orchard we're told Brigham Young himself had, just not here. Further on, the train rolls past a replica of early church leader Heber Kimball's house that once sat in downtown Salt Lake, a reconstruction of the old Huntsman Hotel and Ice Cream Parlor, and further on, a model of the Manti Fort Gristmill. After moving past this old mock-up of 19th-century Salt Lake City, the guide announces the approaching replica of "the ship Brooklyn," a passenger vessel that brought many LDS pioneers from the East Coast, round Cape Horn and to Yerba Buena (an early settlement that became part of San Francisco). Actually, he clarifies, it's more a "representation" than a "replica," because it's little more than a ship-shaped play set some thirty feet long. This is the place where kids will go a little crazy, racing across the deck, down the hatch, grabbing up through grating at any accessible ankles of passersby. The story of these travelers is alluded to by the conductor. There's a map and brief posted summary, along with covered seating at the entry steps to the ship, its history partially illuminated. Some of these settlers eventually made their way to Utah, after stints in farming and the gold rush of '49. The story of this ship and its noble passengers is worth being told and remembering, we are told. The train slows to its station, just a couple benches under a covering. To the left, under another canopy, sit Native American figures, their backdrop several Shoshone teepees and Navajo mud-caked Hogans, "representational structures" that were built in 2009. Along with the "ship" here, there's a mock-up mountain man campsite and a small stream where one can grab a pan and mine for "gold." These treasures are fairly easy to find, too—small shiny nuggets that you can collect while a small band of "frontier" musicians harmonize religious carols. A bit farther down the trail, a small train runs on a circular track around a pond, its pleasant conductor perched like a vulture behind the miniature engine. The whole of the valley, no longer mere grasslands and streams and visions of a possible future, but a tangled web of highways and neighborhoods and lived dreams, is laid out beyond. An occasional airliner coasts the mountain-bordered skyline. This is the place. Drive on. 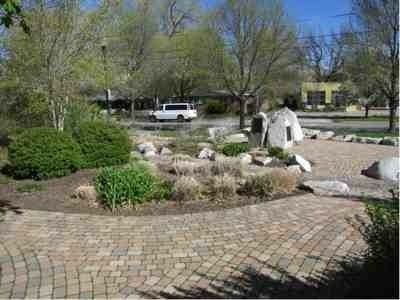 Five miles to the southwest sits a small square corner plot with cast-iron benches, a rock garden, and stone walkways, across the street from a tax office and catty-corner from an Arctic Circle fast food restaurant. 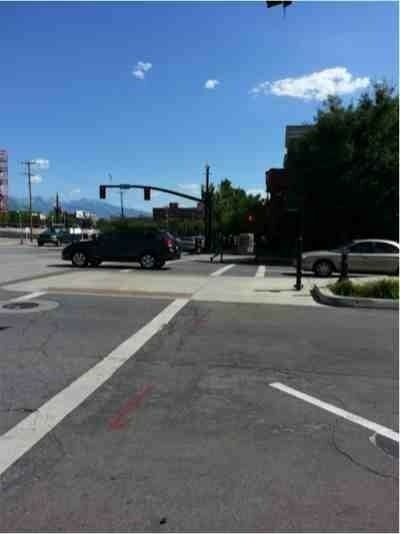 This is the place where the "first encampment" of Mormon settlers came to rest, on the corner of an intersection of streets five blocks east and 17 blocks south of where the Salt Lake Temple now stands. But then, in 1847, the valley stood bare and uncivilized before them. This advance group arrived two days prior to Brigham Young's party and followed the slope of thick grass upon thick grass along a sunken pathway, known now as The Draw, beside Parley's Creek, down until the land finally began to level out. Here, the settlers found a place suitable enough to set up camp, and they reveled in the possibility that their long journey was finally at an end. The next day, they moved a few miles north to City Creek Canyon, where the foundation of Salt Lake City and the Mormon Temple would be sketched out by Brigham Young less than a week later. The creek itself and that path they once followed have long ago become subsumed by development, driven underground by streets and houses and a modern world enveloping and consuming the past. This plot remains, though, its long grasses that so fascinated those pioneers replaced by boulders and stones to symbolize the canyons and creeks they had earlier surmounted, and a few simple markers noting its place in place and time. Death came to the early pioneers at least as soon as their realized dreams and often long before. The Mormon pioneers, much like others of their age, were dedicated to celebrating the new lives that were born to their budding civilization and memorializing those that departed. By necessity, they protected the bodies of the dead carefully to prevent the ravages of animals and weather. But time buries the past, even monuments to its remains. Which is how a construction company working in downtown Salt Lake quite by accident unearthed the bodies of Milton Therkill and his fellow Missourian settlers in 1986, after some 140 years at peace in the ground. Found were 34 human remains. Eight of those were pioneer adults, one an adolescent, and 24 were children. At least five were related as closely as cousins. 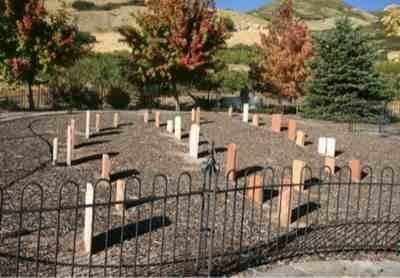 There was one last body that wasn't a Mormon pioneer and wasn't buried near the same time as the rest. Genetic tests determined it was Native American, and so it was given to the Paiute Tribal Council for ceremonial reburial and hopes of a more permanent final rest. On the street corner, down the block from a couple local breweries and beside a complex of upscale apartments, a single stone marker commemorates the lost and found and lost. Out along The Draw, the path where those vanguard pioneers followed Parley's Creek as it drifted down into the lower valley, lies the community of Sugar House. So named because of early (and failed) attempts to create a beet sugar industry, it instead became a hub of rail lines, furniture stores, and the state's first prison. Residents liked the name, though, and kept it. The prison population was eventually moved and its buildings razed and replaced by a high school and a large undulating park now popular with bikers and joggers in the summertime and sledders in the winter. The Sugar House furniture mecca eventually lost its following, as well, and streets and shopping plazas slowly replaced those storefronts. Old abandoned rail lines and loading docks lie crumbling in creek beds and on side streets as the new centers of commerce and life have overgrown them. 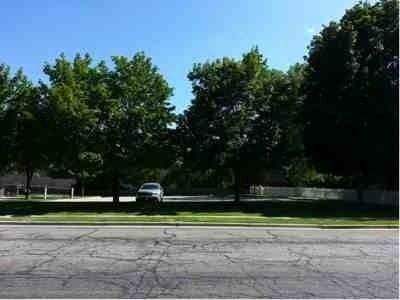 At the southwestern edge of Sugar House sits the quiet neighborhood of Forest Dale. The land had once been the possession of Brigham Young himself, and it was here that he owned and operated a dairy farm that was the center of the community. Young himself never lived here, but it is said he used it to host functions for his increasingly scattered flock. Young also used it as an experimental test farm, engaged in the cultivation of sugar beets, alfalfa, and mulberry, as well as sericulture—the raising of silk worms—all unsuccessfully. And it was from the aging church president himself that George M. Cannon bought this land and gave it its name. Residents soon were popping up on plots around the farm throughout the 1890s. 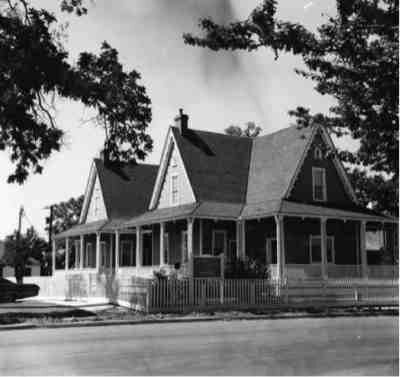 It grew rapidly; large enough, in fact, that at the turn of the century, the people voted to separate from the city entirely, and the town of Forest Dale was born. Ten short years later, facing bankruptcy, it voted itself out of existence, returning once again into the folds of the city of Salt Lake. The Interstate now abuts its southern edge, and some of those early homes were torn down and replaced with low-scale apartments. 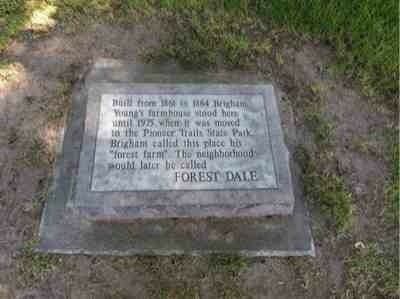 Still, Forest Dale now sits on the national registry of historic places. A majority of the original houses still remain and maintain their original character, including Cannon's own home, though it has since become a bed and breakfast (most recently, Swedish-themed). There's a freeway running through its backyard, though the acoustics oddly elevate the sound, making it so quiet you might never realize it's there. Beside Cannon's house is the tiny parking lot for the dome-topped Ward House that lies across the street. 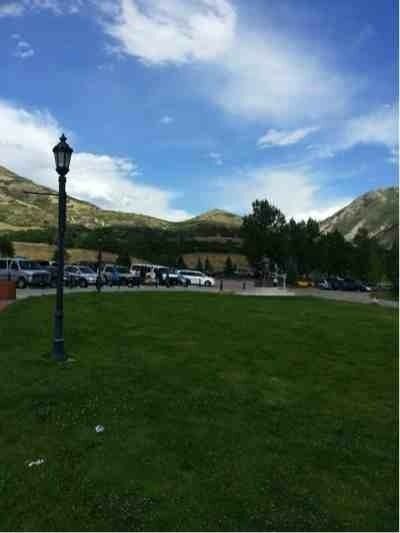 Brigham Young's Farmhouse stood here. The "this" of This Is The Place is not this place. Brigham Young's monumentally and appropriately portentous pronoun was meant to indicate the valley below that lay semi-virginal between the Oquirrh Mountains to the west and the Wasatch to the east, with the Great Salt Lake lapping at its doorstep. But in another sense, this is not the place also because nothing is of this place. It is instead a place of other places—replicated, rebuilt, or relocated... or re-imagined. For not everything here is mere imitation in body and form. After you pass what is called Brigham Young's Barn, "a representation of the farm barns of the pioneer era," you come to a large building with a wraparound porch, a place you can rent out for gatherings—corporate retreats, wedding receptions, birthday parties. The building is bright pink. The tour guide takes special care to inform us that this is the original color and that pink was then considered "manly," lest anyone draw any other conclusions. 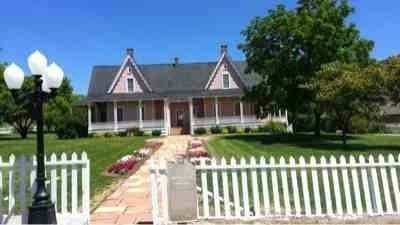 This is what they call Brigham Young's "Forest Farmhouse." And this is not a replica or a representation. It is the Real McCoy, lifted and moved from Forest Dale and Sugar House five miles below, carried back up The Draw, back up to the place where this all began but where it never was at all, leaving behind at the place itself nothing but a marker in memory of what once was there. And this place is taking everything back, so much of its pioneer history. The Levi Riter Cabin (relocated 1989). The William G. and Sarah Jane Burnett Log Home (1999). The Margaret Hickman Cabin (1994). The Richardson Cabin (2010). Joseph Staker Cabin (1996). The Richard and Mary Goble Pay Home (2001). Zion's Cooperative Mercantile Institution (Z.C.M.I.) (1996). Samuel Jewkes/ Henry Draper Home (1980). John B. Fairbanks Home (1981). Andrus Halfway House and Farm (1980). Levi Roberts Cabin (1980). Up beyond the petting zoo, the children's play area and water park, and past the replicas of the Madsen Furniture Company and the Fireman's Social Hall, there's a bend in the road where you'll find a small and solemn cemetery. Another final resting place for Milton Therkill and the Missouri pioneers of Block 49. It's taken them back, too. Everything scattered through pioneer history exists here now at This Is The Place, the real and the unreal, but this is not the place of anything, really. It is the place where nothing is from. affixed back eastward, horn at the ready. Figures at the base of this structure represent other significant groups and individuals from the time of the pioneers' arrival in the west, including John. C. Fremont, Eastern Shoshone Chief Washakie, early Spanish explorers, and notable trappers. Those early Mormon settlers themselves are here, as well, captured amidst their cheering hosannas in celebration when the caravans finally came to rest at the spot that would become downtown Salt Lake City. 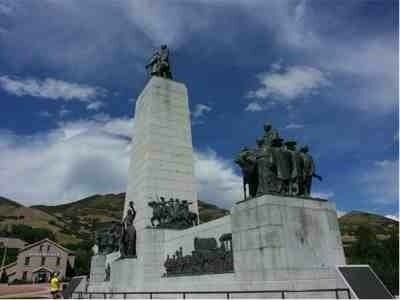 This particular monument was built in 1947, a symbol 100 years later of that exact moment when Brigham Young lifted himself sick and weary from that wagon and pronounced their arrival. 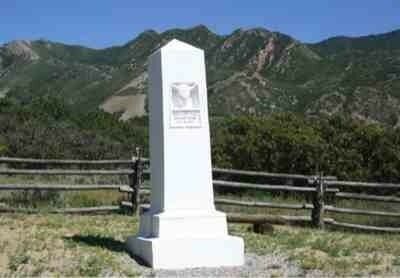 But this monument is not the place, does not even mark the specific place where he said that. That place is also elsewhere. But it was determined that the ground on this spot was better suited for the appropriate grandeur. At a small park across the road from the monument, just east of the zoo, sits another monument of sorts. 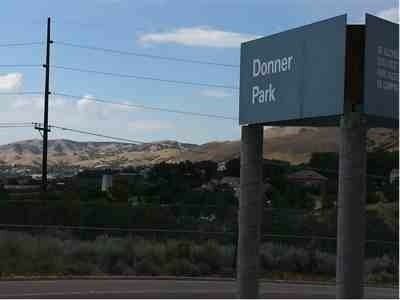 That place is Donner Park, named for the encampment where that fateful party stopped in the valley the year before the Mormons' arrival, on its way west into the frozen Sierra Nevada range and detainment followed by starvation followed by infamy. 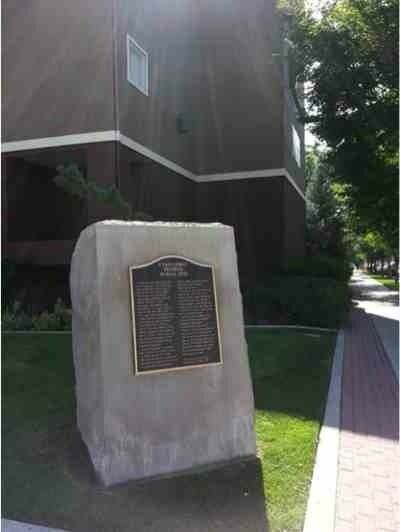 The Donner Party, too, is finds itself represented on the grand monument at This Is The Place. But that is neither here nor there. As the simulated train rounds the final bend back toward the replicas of the old Deseret Hospital (now with Quilt Museum), the Hooper and Eldredge Bank, the B.F. Johnson Saddlery, the representation of a conductor gestures off down a side road, into the thick brush of trees and foliage off to the south. 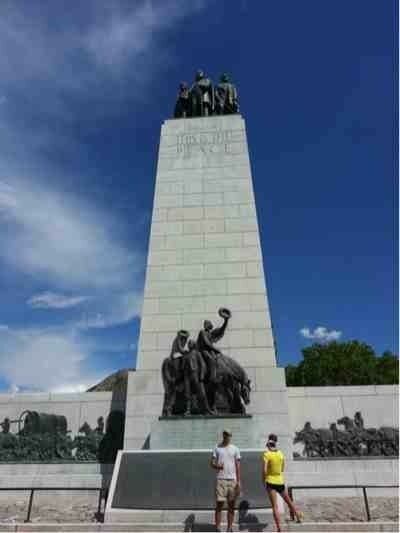 There, he notes, stands the monument near the true location where Brigham Young made his famous statement that gives this park its name. It wasn't until early in the 20th century that a troop of Boy Scouts finally marked the spot with a small wooden cross. Then, a few years later, a stone obelisk replaced the cross, with a white peak you just might see fading into the undergrowth. "If you have no idea what an obelisk is, you should check it out," our guide jokes, though the train does not stop.